My niece, Becky, just purchased her first place - really proud of her!!! Becky's small condo has a room that's referred to as a second bedroom, but truth be told, it is beyond tiny and does not have a closet. I suppose a twin bed could be crammed against the wall with a mini table to one side. While the room lacks square footage, it does get an enviable amount of brilliant sunshine. Becky has been stressing out about making this room into a stylish and happy home office with a cozy sitting area, all on a modest budget. I told her: don't worry, let's go shopping. Please know that my niece, as much as I love her, is not a tone-on-tone girl - she adores color! Our first and only stop was HomeGoods. And just to be clear, this is not a sponsored post nor have we been compensated by HomeGoods. 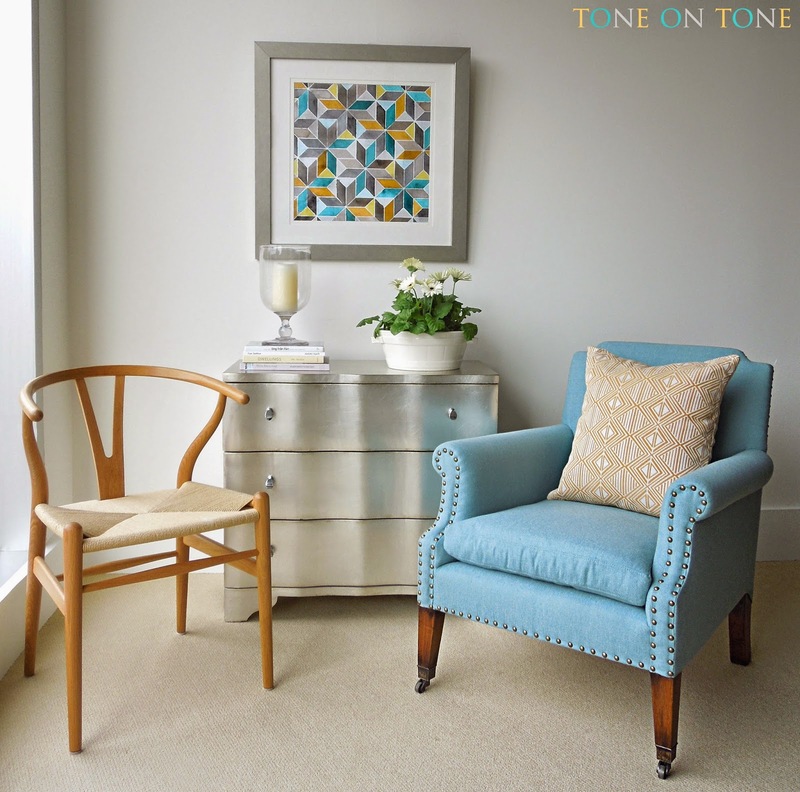 I fell in love with the tailored lines of this small-scaled clubchair, and Becky couldn't resist its aqua-blue color, so we grabbed it. 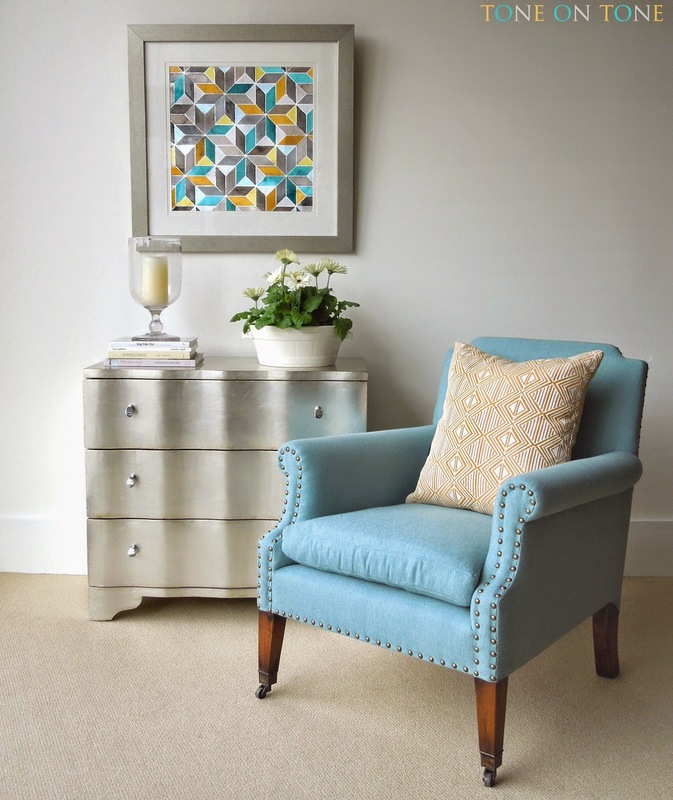 Just look at those tapered straight legs, front castors and nail head trim - beautiful! It became the starting point for the room. 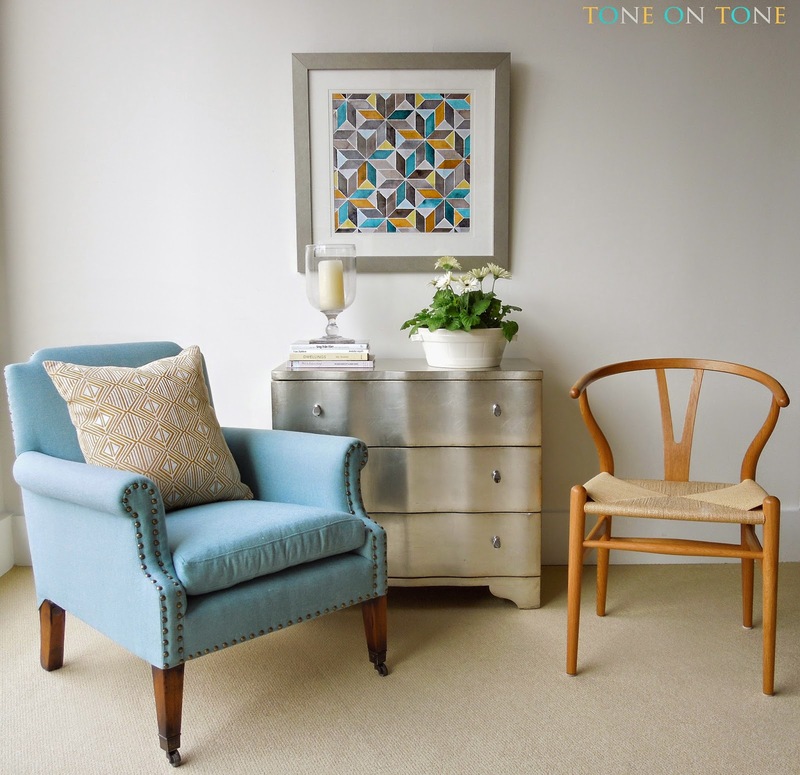 Time to jazz it up a bit and look for something different. Hiding in the artwork section was this dresser with a silver leaf finish. It does have some scratches, so check everything carefully. Again, the size is perfect and it's young, glam and unexpected. 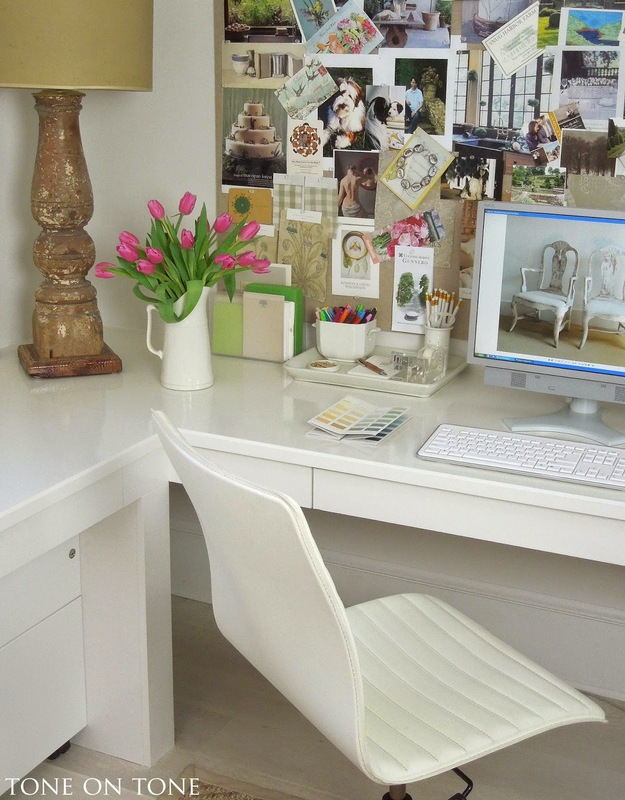 The Danish Wishbone chair is mine, but I'm thinking Becky should have it for her desk chair. We didn't find a desk, though. Any suggestions? Her condo is being painted as well as carpeted, so I'm holding the goodies at my shop.....very tempting, Becky! 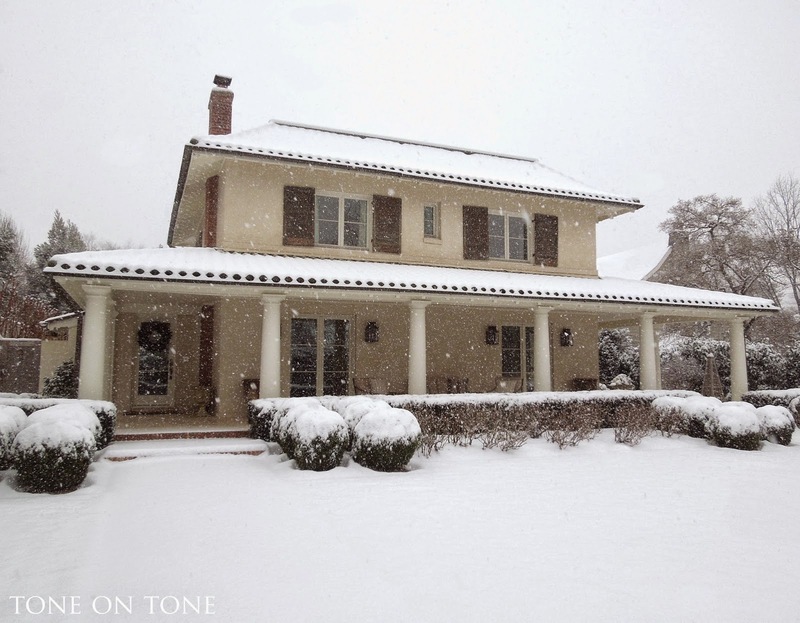 In case you missed my previous post, Tom and I have decided to downsize and sell our DC home. Many thanks for your calls, emails and blog comments - much appreciated! Your compliments and support warmed our hearts, as we have poured much passion into the restoration, renovation and work on both house and garden. 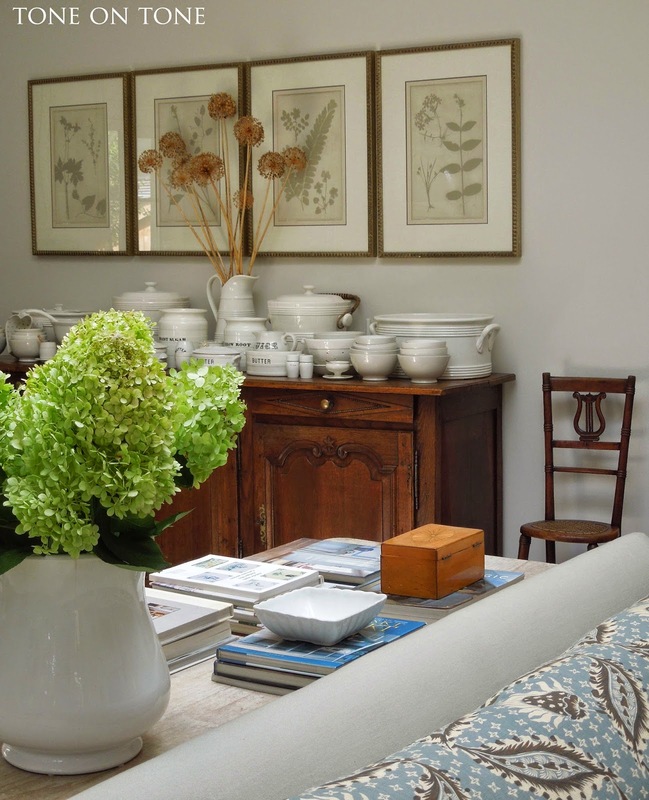 When I first toured the property - which had been loved by the Belfiore family for over 60 years - I had a vision of what it could be: a historic home graced with beauty, light, flow and open views to verdant gardens with seasonal colors. 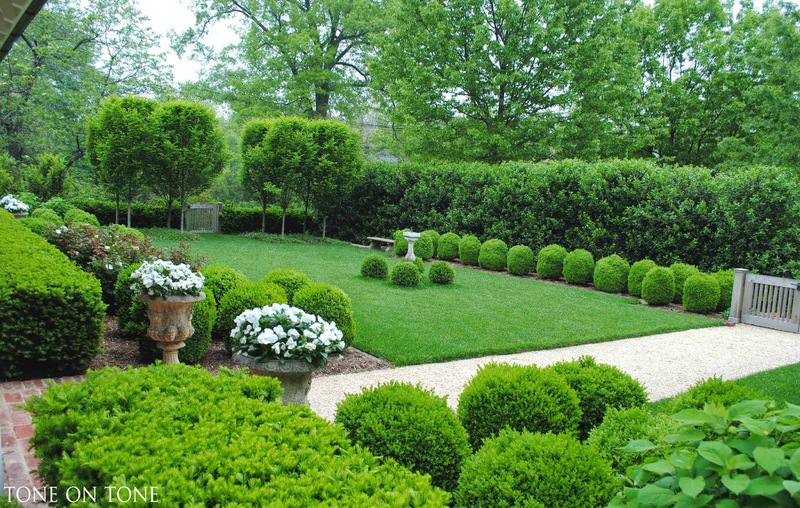 In shaping the gardens, I looked to the loose plantings of English gardens for softness, as well as the clipped landscapes of Belgium for structure appropriate for a city plot. Executing this vision has been a labor of love and a learning experience. Before (above) and after (below). 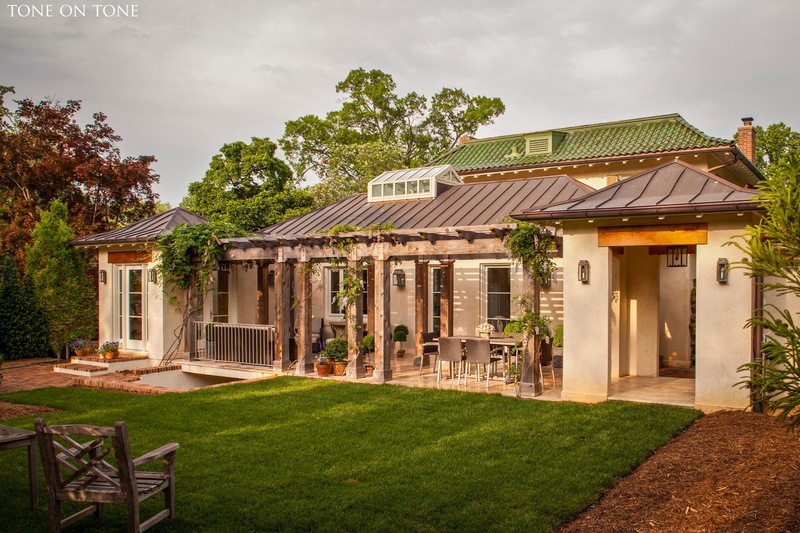 The house was sandblasted and re-stuccoed; layers of paint on the shutters were stripped to reveal their early painted surface; front door was relocated to the side; and boxwoods, yews and a leveled lawn replaced a weedy yard. What have I learned? 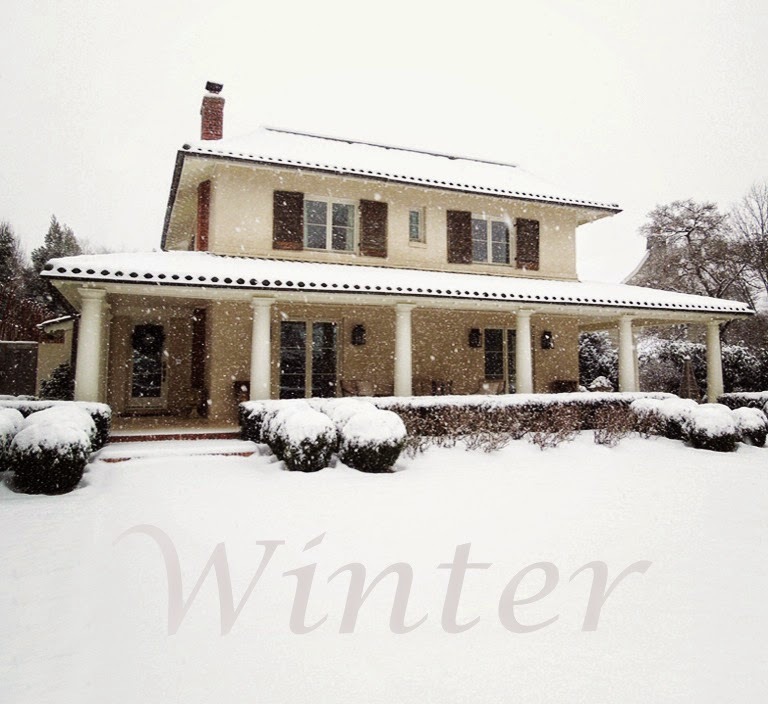 Invest in energy efficient windows and doors - worth every penny in DC where temperatures can go from near zero to almost 100 degrees. Invest in an irrigation system because there will be times when you just don't want to be outside in the heat. Design a garden with a succession of blooms, and choose plants that flower for a long period, because garden tours are more fun when you don't have to keep saying: you should've seen the garden last week when it was blooming. How tiring that becomes! And just to clarify: we are not leaving the DC area, nor is our shop moving. 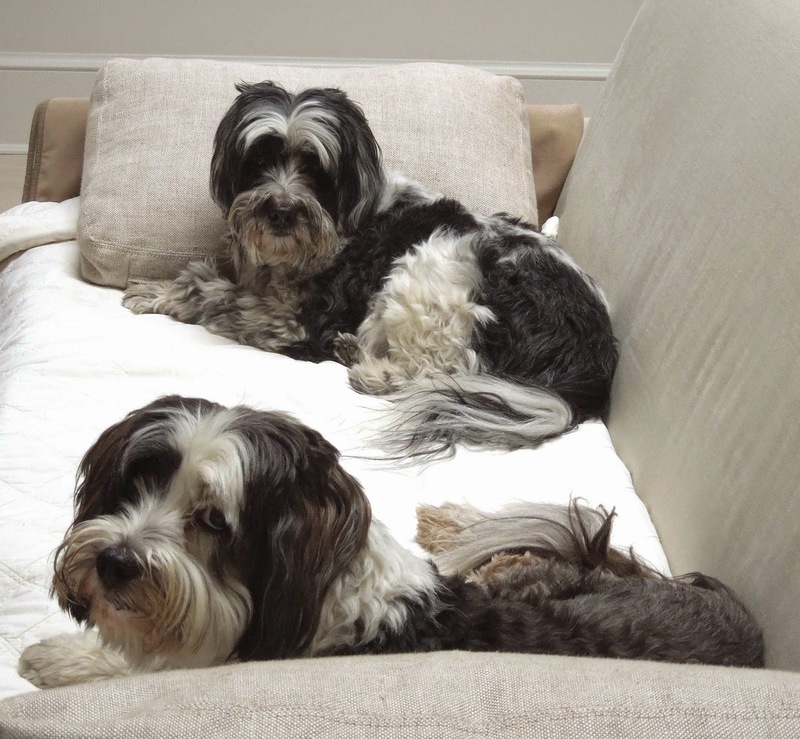 We simply want to downsize to a smaller home here, so that we can spend more time at our summer home in Maine. We love both Washington and Maine! Soon I will show the other rooms of the house along with before and after photos. 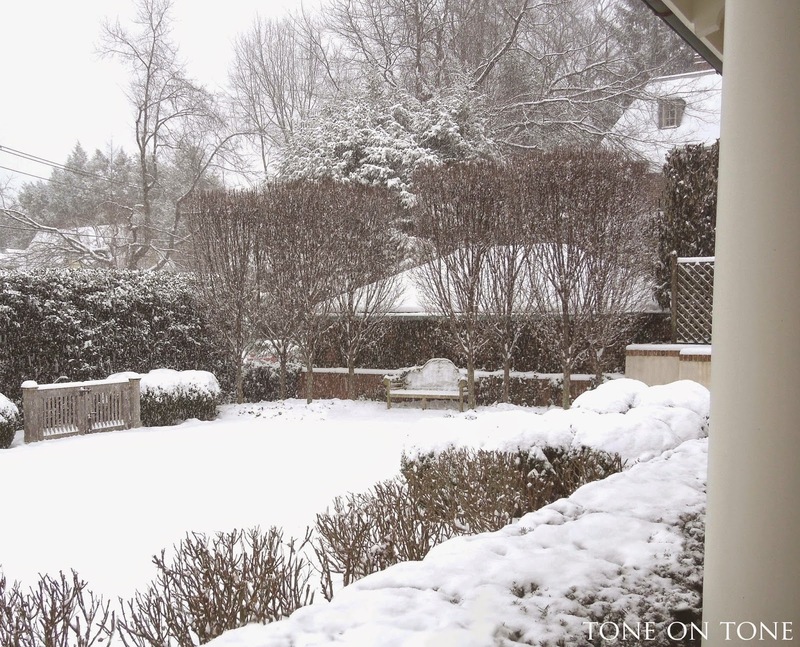 But first, DC had its first snowfall of the season - always magical! Yes, I still rush to the window when I wake up to see if there is snow. 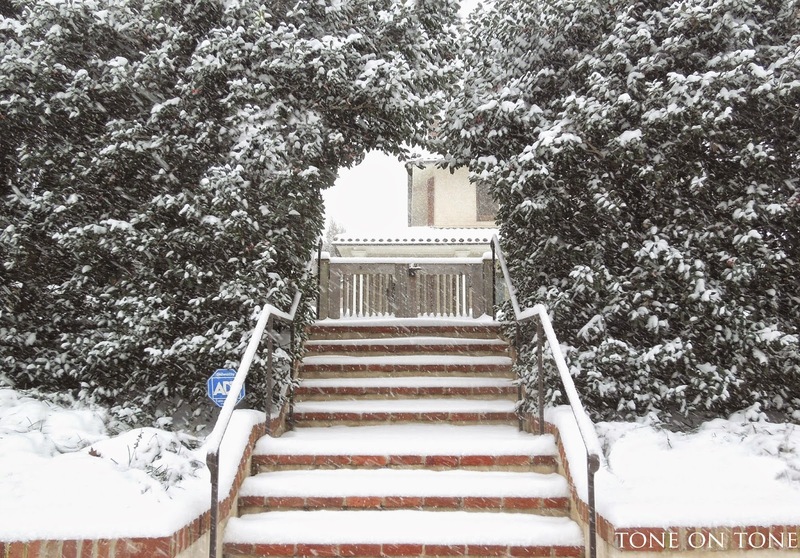 Here is our garden dressed in winter white. It has taken six years for the Nellie Stevens holly hedge to finally form an arch over the front steps - there's about seven feet of clearance under the arch. By the way, Nellie Stevens is a treasure - it's a handsome, hardy and healthy holly! A row of them provides privacy; also a dramatic backdrop for white flowers. I custom designed the cedar gates with square spindles set on the diagonal. The span is about six feet, which is the width of the crushed gravel walk currently blanketed by the snow. Looking across the front garden (or "sundial garden" when I'm feeling fancy), the structure of the eight sheared European hormbeam trees can really be seen during winter. The low yew hedge behind is punctuated with another cedar gate. Instead of closing off this garden, I designed this gate to allow friendly passage to and from the neighbor's garden. And the break in the hornbeams provides a borrowed view of our neighbor's stately magnolia trees - it hints at gardens beyond. 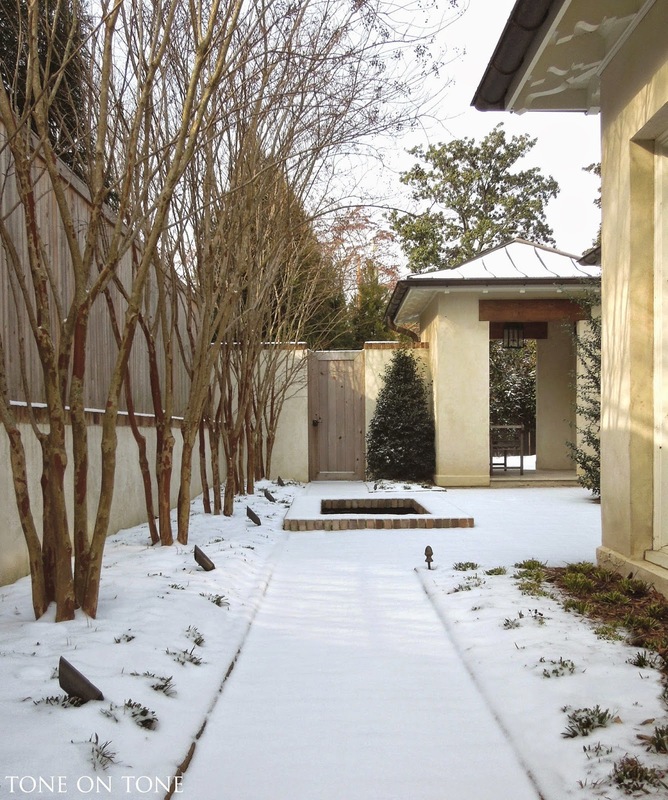 BELOW: Eight more sheared hornbeam trees anchor the other side of this garden. 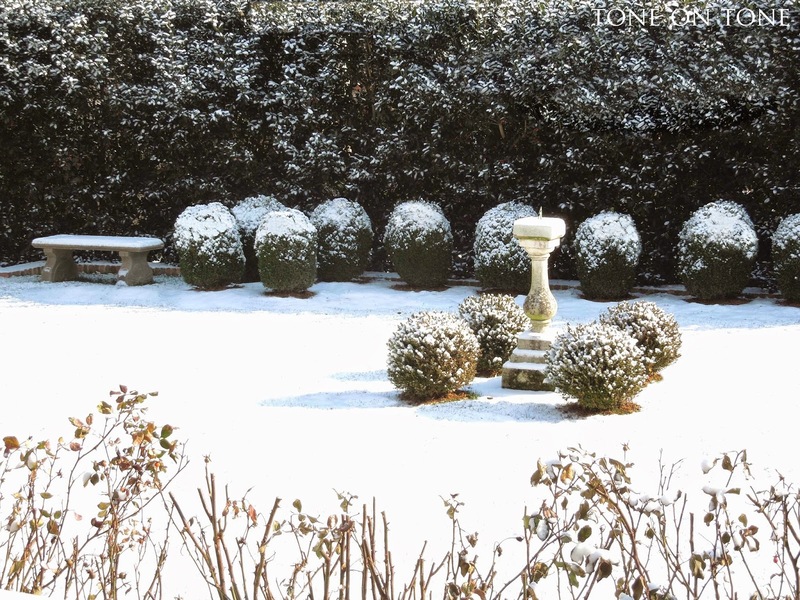 Hollies, boxwoods, yews, laurels and ivy stay green year round. 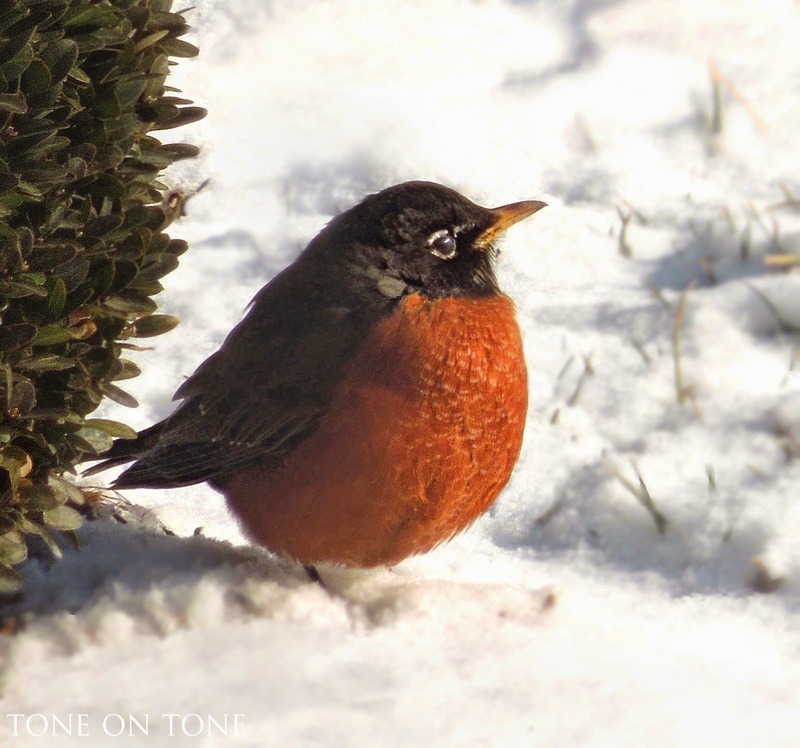 Here are more photos of our garden in previous winters, starting with my robust little friend. Our garden is frequented by robins (along with cardinals, mourning doves, hummingbirds, etc). 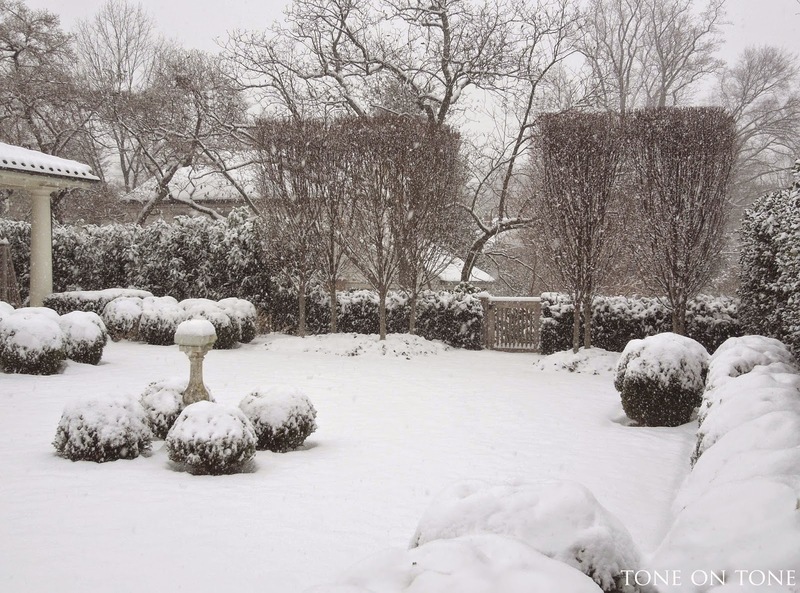 A view of the walled courtyard dusted in white. 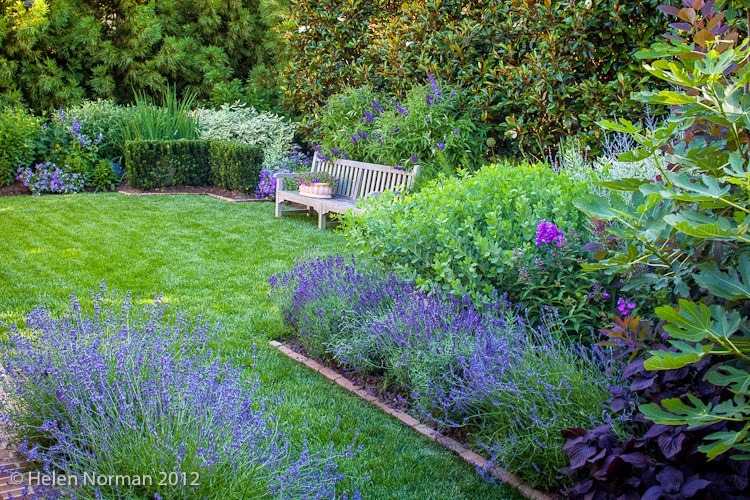 This was the last garden I designed on our property - it's a lovely, private and protected outdoor room. A happy and healthy new year to all. I made just one resolution: to wake up early! For the record, I've already broken it :( Ohhhhhh, well! 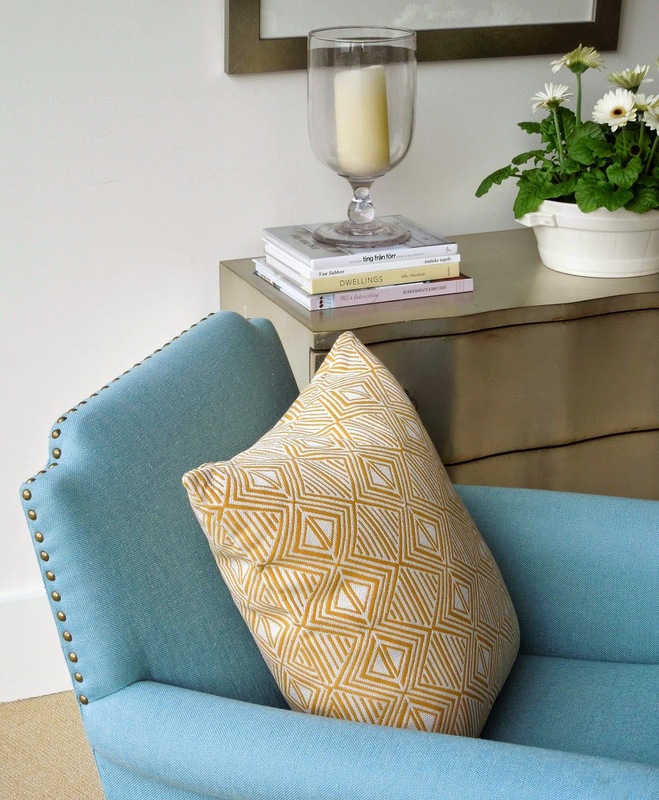 After the bustle of the holidays, this is the time to relax, refresh and regroup. It's about taking long walks after indulging in so much food. It's about being cozy next to a warm fire. It's about change. So now would be the time to announce a big change for us. 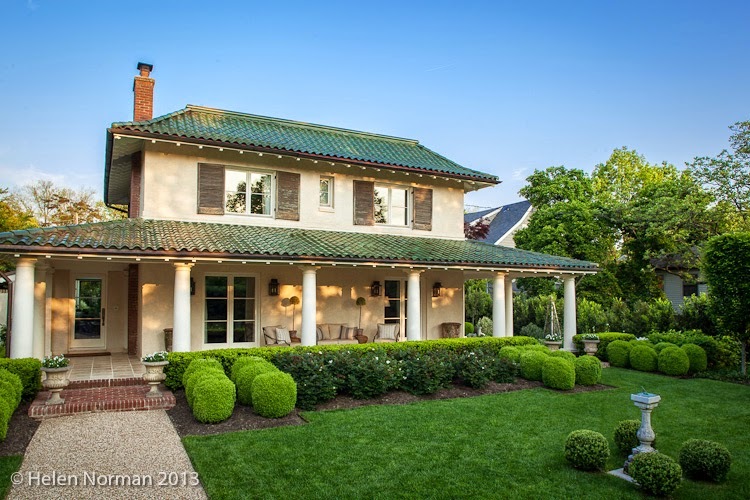 Though there is no official listing yet, Tom and I have decided to sell our home in Chevy Chase, DC. Why? We want to spend more time in Maine and downsize in DC. (And I do mean downsize, not downstyle.) We still love our home, but it and the property are much larger than we need, especially if semi-retiring one day in Maine. 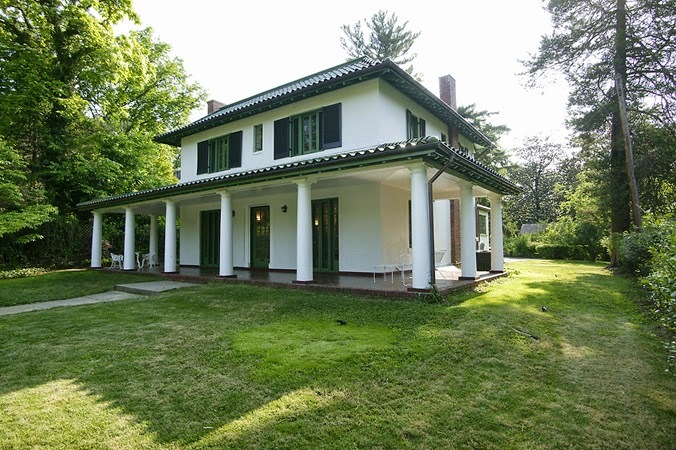 Designed in 1915 by the architectural firm of Murphy & Olmsted, our house is in the Spanish Colonial Revival style - a standout amongst the parade of Colonials and Foursquares in Chevy Chase. Murphy & Olmsted built many Italianate and Spanish style homes across the country, and they were well regarded for their work in various Mediterranean interpretations. 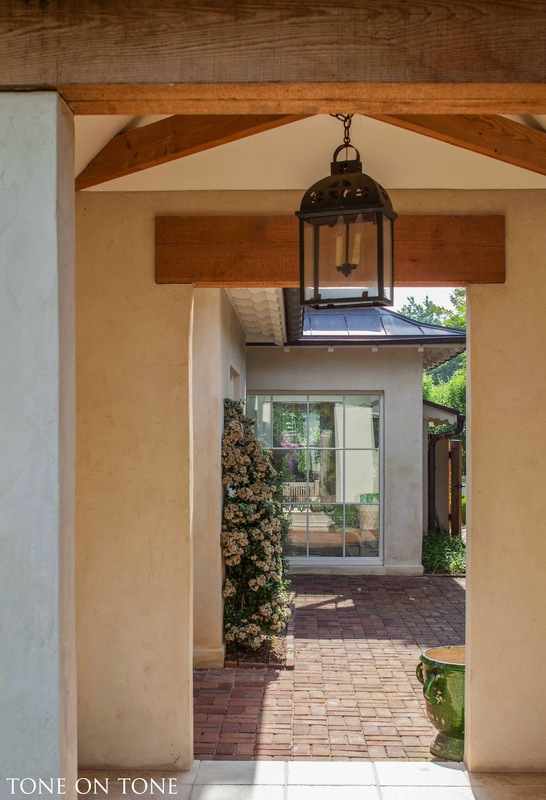 Our house does have the spirit of a Mediterranean villa with its expansive loggia, stucco surface, French in-swing doors and windows, and signature terracotta roof tiles glazed in green (which is similar to the shades that flow throughout Provence). 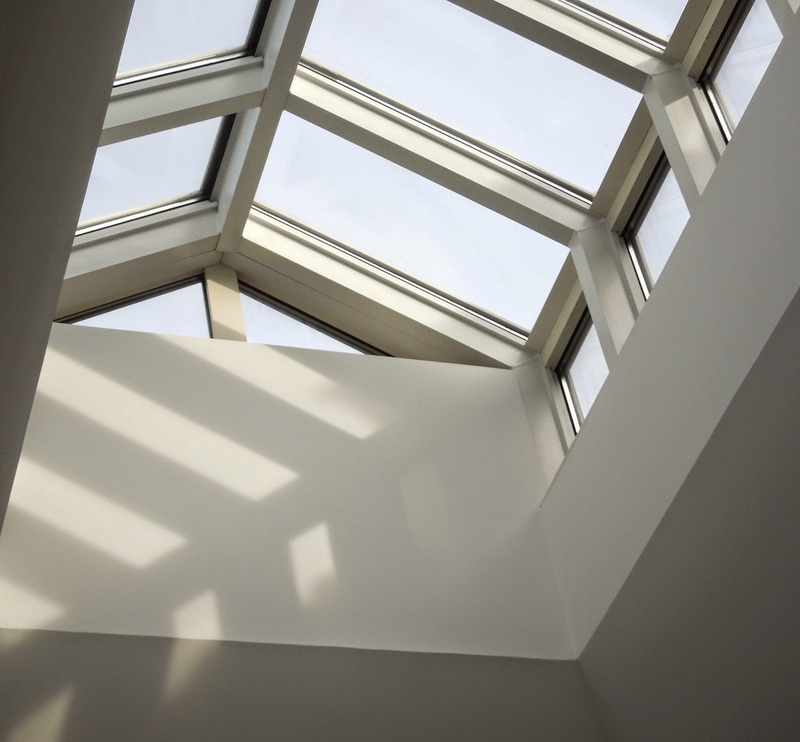 From 2008 - 09, we worked with the acclaimed firm of Muse Architects on the restoration, renovation and addition. 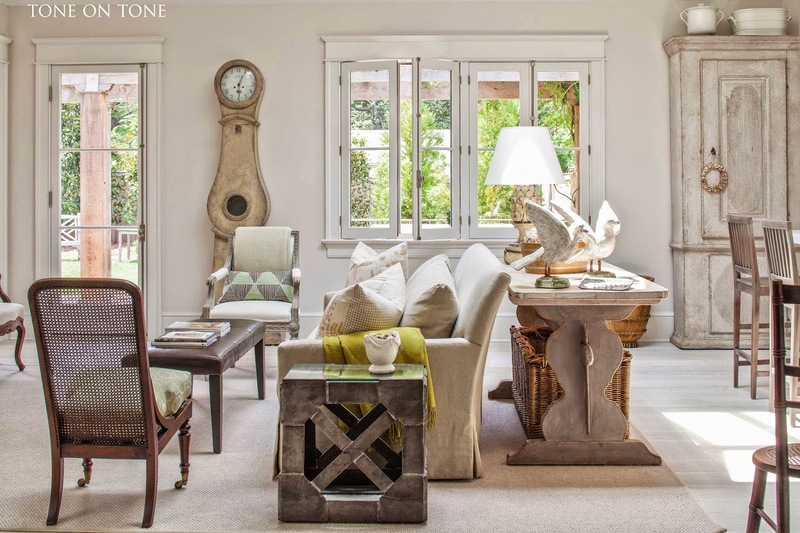 The result is a gracious, historic home with a floorplan designed for today's living. 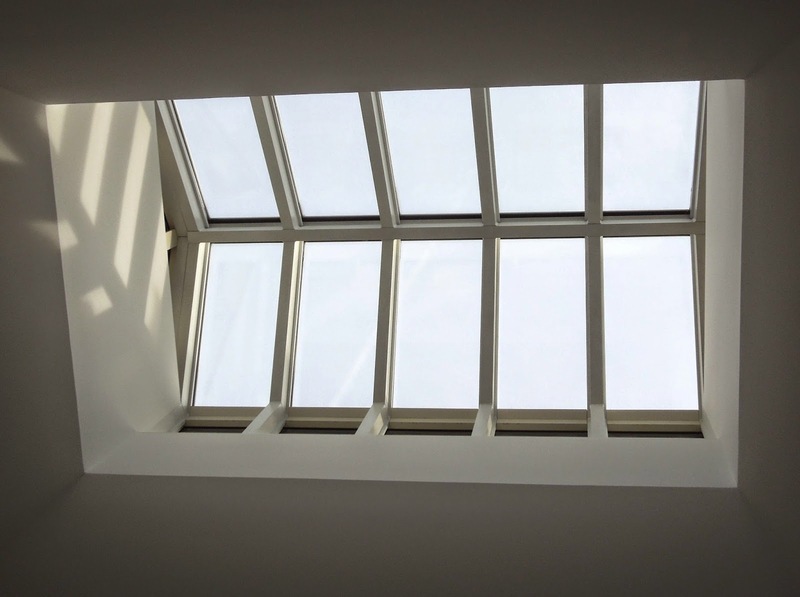 The rooms are generous and flooded with natural light from French doors, wide windows and conservatory style skylights. I custom designed all the built-in bookcases, desks and furnishings throughout. HVAC and electrical systems are new; as is the plumbing with copper pipes. 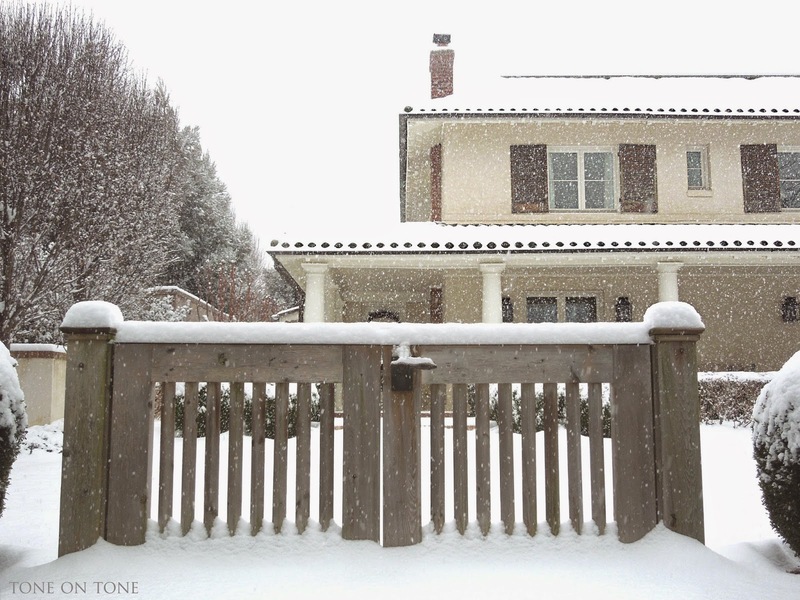 Of course we'll miss our home with its beautiful connection to the gardens, which I designed to be evergreen with structure year round. 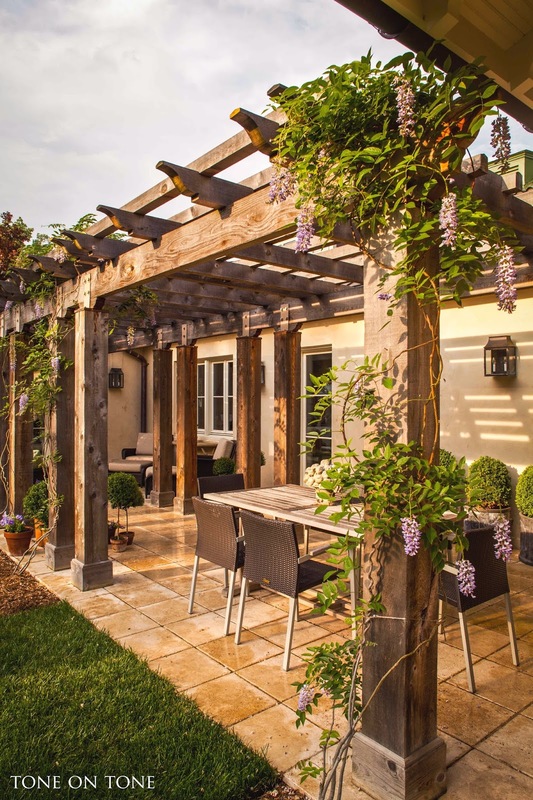 The gardens are actually a series of outdoor rooms opening upon each other and, more importantly, can be fully enjoyed and accessed from within - five rooms on the first floor open directly outside. DC is full of splendid homes, but I have to say not many command such a special lot that is both private and walkable to shops, restaurants and Washington's last independent theater. The house is perched on a flat parcel atop a little hill. Since I have never shown a proper tour (thought I'd have plenty of opportunities as we were planning to live here a while longer), let's go on one. We'll start with the "heart of the house" located at the back. The following photos were taken over a period of six years - click for a larger view. The kitchen, family room, home office, mudroom and powder room are located at the back of the house - it's where we spend most of our time. 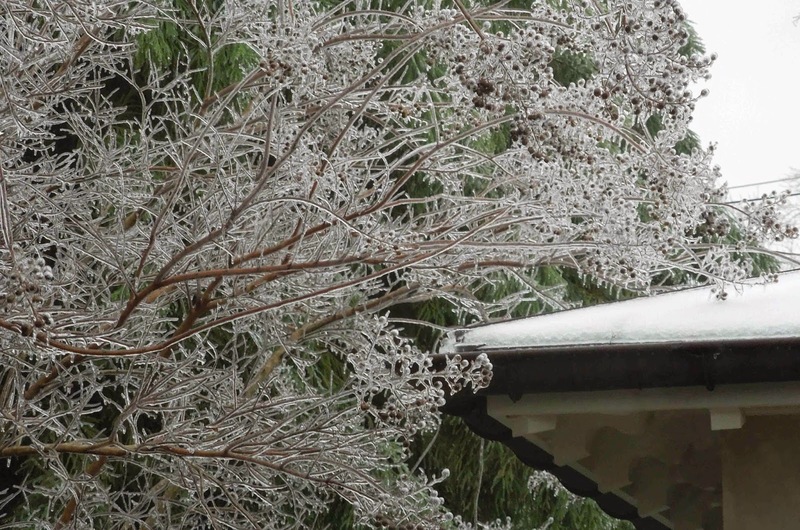 From outside, it looks like a series of garden pavilions with pagoda-like roofs. All the buildings with copper roofs are additions designed by Muse Architects. 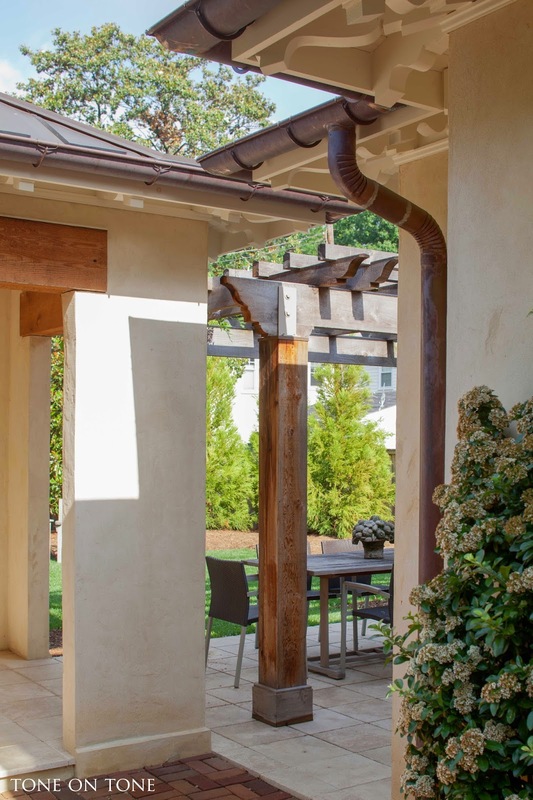 On the left is the mudroom, which is connected to its twin, the gazebo, by a long terrace with a rustic cedar pergola. 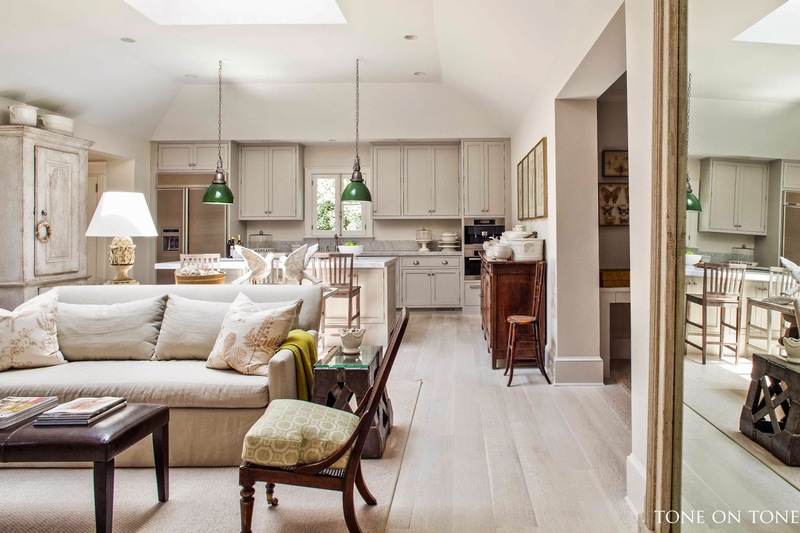 The family room and open kitchen share one large, lofty space with a raised tray ceiling punctuated by a cupola-like skylight in the conservatory style. No matter how dreary the day outside, it is always bright here. A view of the family room out to the blue garden. All the in-swing doors and windows, with cremone bolt hardware, were imported from Quebec, Canada. They are extremely energy efficient. 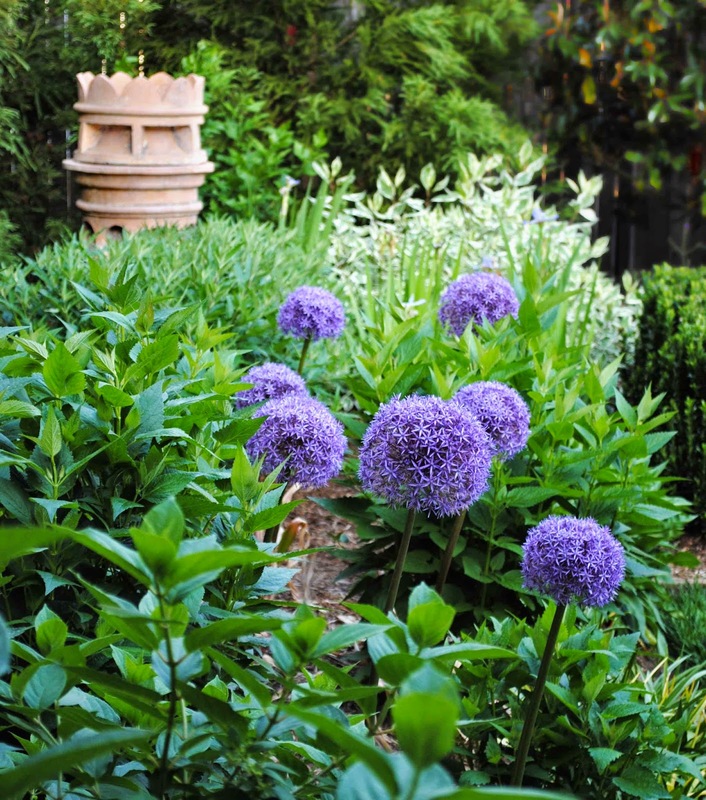 Most of the flowers in the blue garden bloom in shades of blue, lavender or purple. A glimpse into the dining room. Though I love a pale color scheme, it's important to ground this palette with darker tones such as the pair of antique French walnut armchairs, vintage black iron industrial tables and lanterns, and brown leather bench from Crate and Barrel. 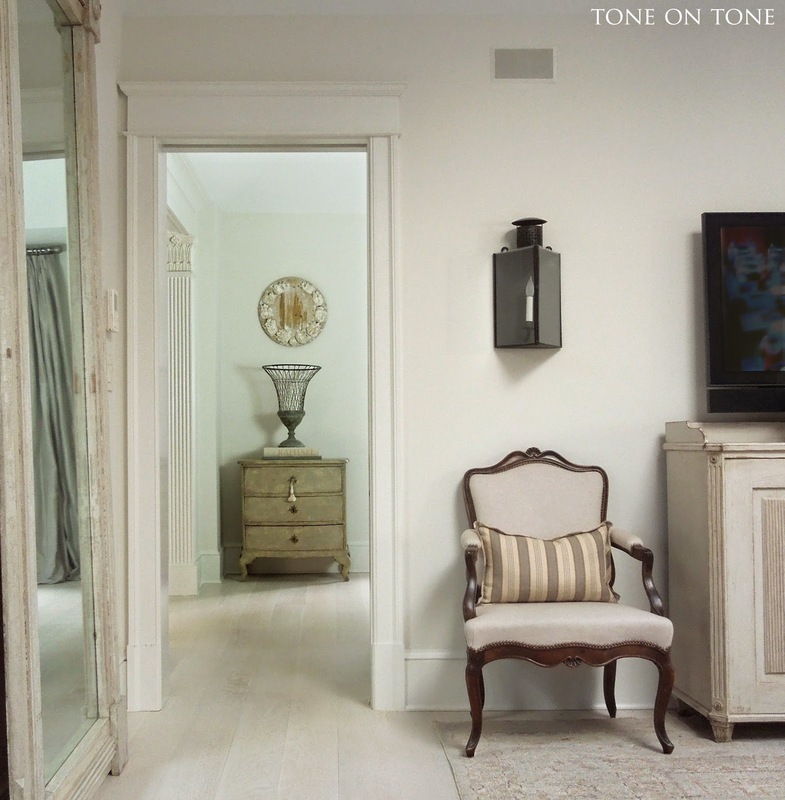 Under the TV is an antique Swedish Gustavian style sideboard which houses the A.V. system. 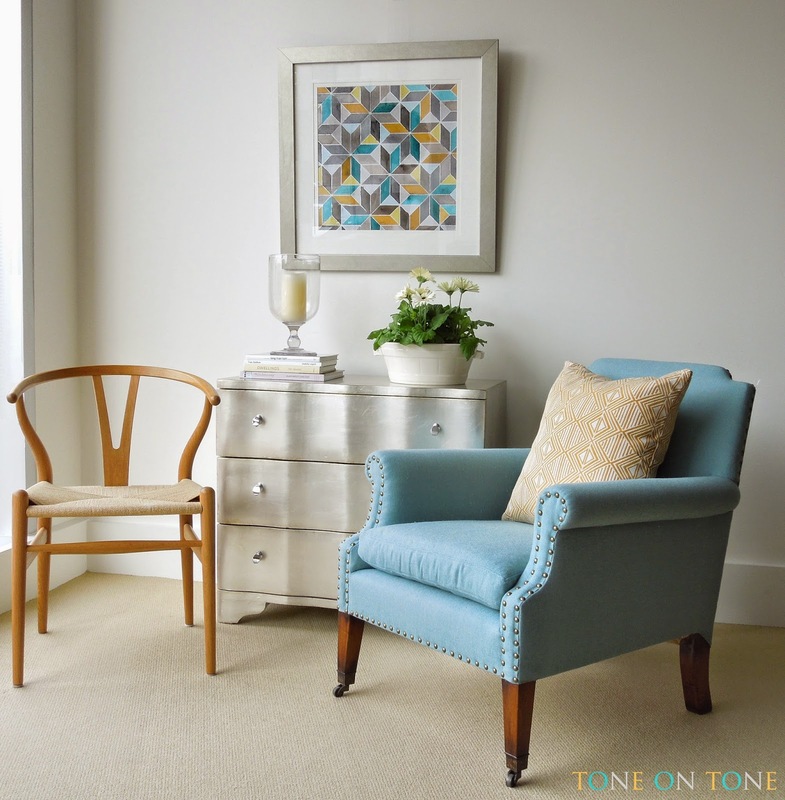 The Oushak rug continues the grays, greens and blues. Dividing the family room from the kitchen is an early 1800s Swedish trestle dining table which we use as a sofa table. Since this room is a new addition, it was important to fill it with found objects and pieces with history, character and imperfections. It's not meant to be matchy. Here is our kitchen with it's Swedish inspired gray cabinets and, once again, notice I left room for a couple of antique cupboards. 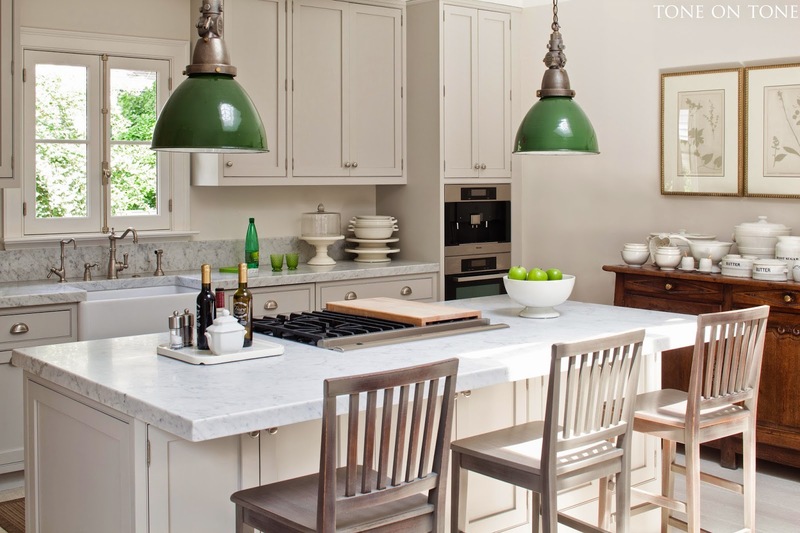 Vintage green pendants from an old G.E. factory add a pop of color. 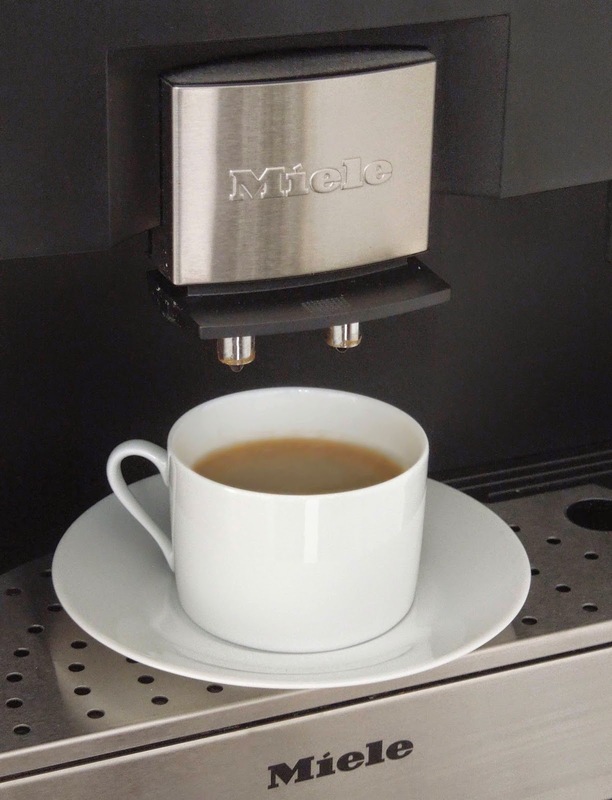 How about a cup of cappuccino, coffee or espresso? 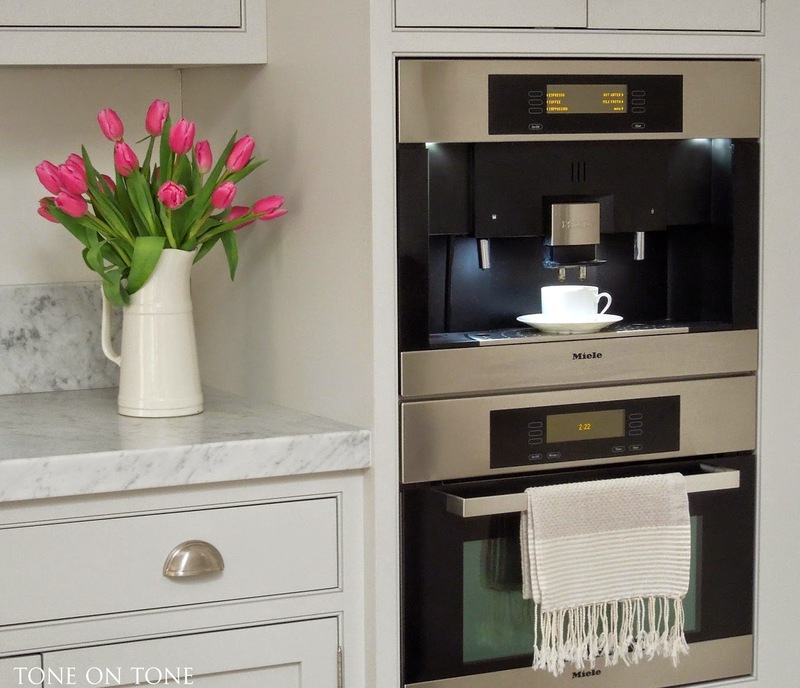 Below the coffee machine is a combo speed convection / microwave oven - quite handy! 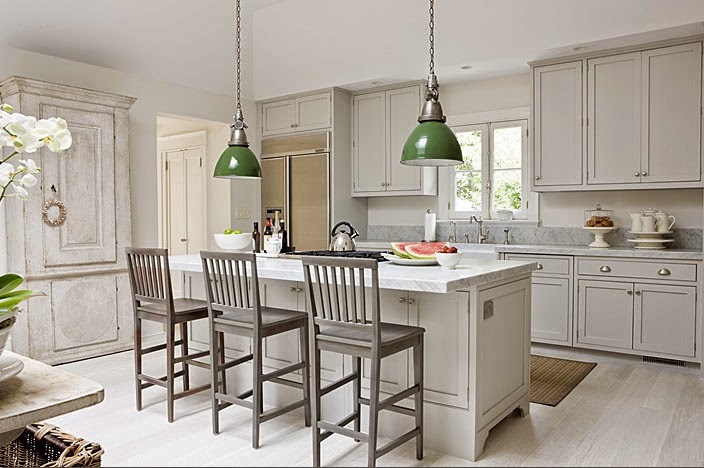 Our Carrara marble counter tops are actual 2" slabs, not the standard size with a facade edging. 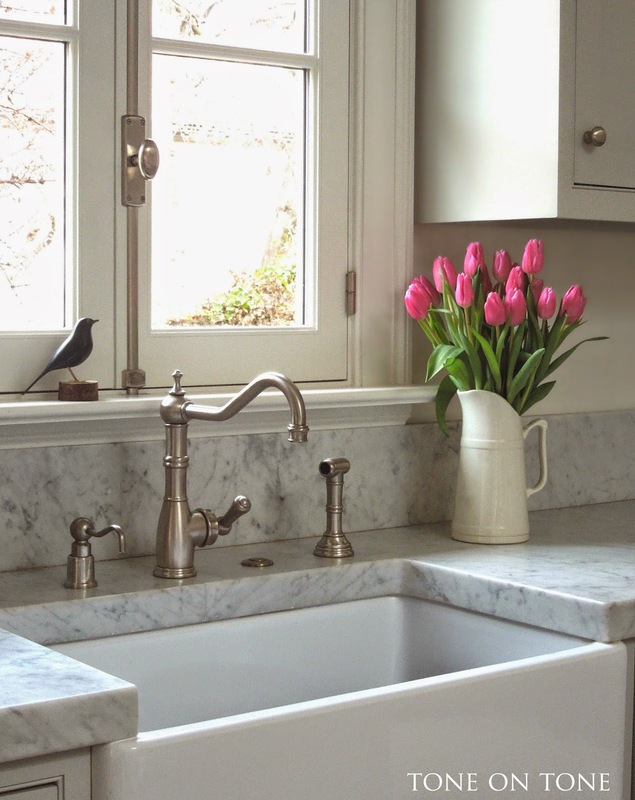 The faucet is from Rohl. 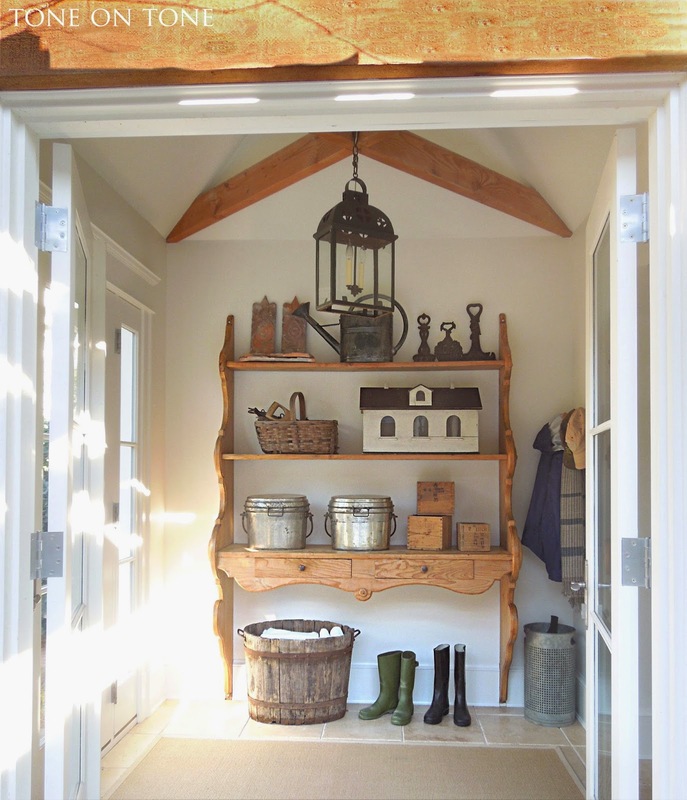 The vestibule to the left leads to the mudroom (shown below). To the right of the kitchen is our home office - this is where the original kitchen was located. We've thought about making the opening just a bit smaller and adding French doors for privacy. I designed this corner workstation to be functional and simple. 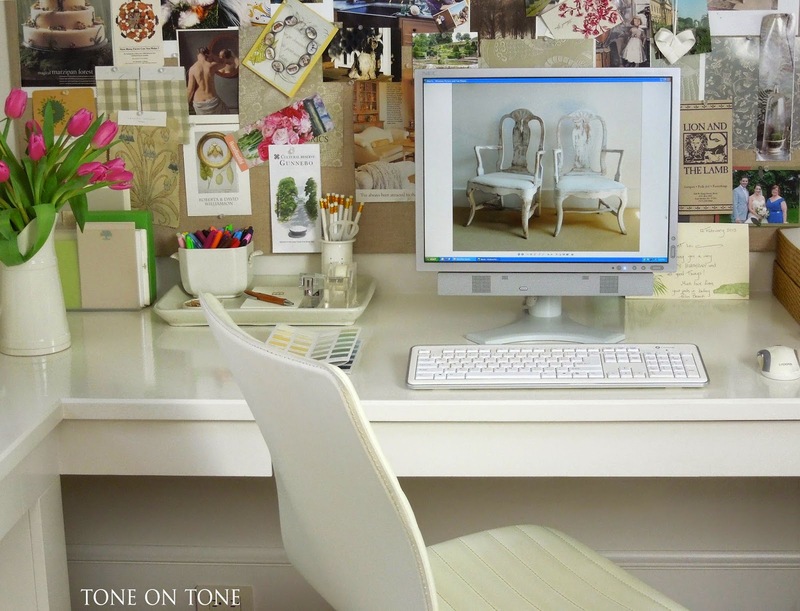 The built-in desk is painted in Benjamin Moore White Dove in high gloss for a modern look. 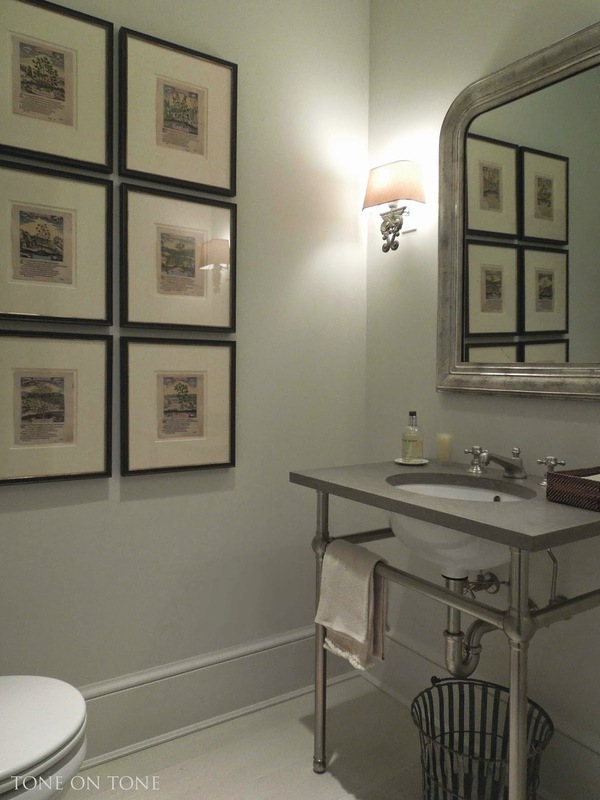 Tucked discreetly to the right of the office is a powder room. 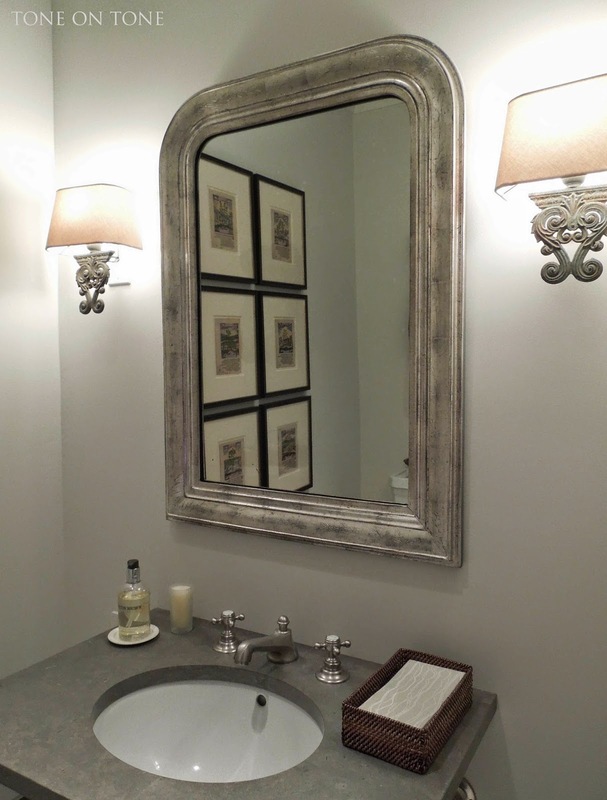 The toilet, sink console with limestone top and faucet set are all from Waterworks. 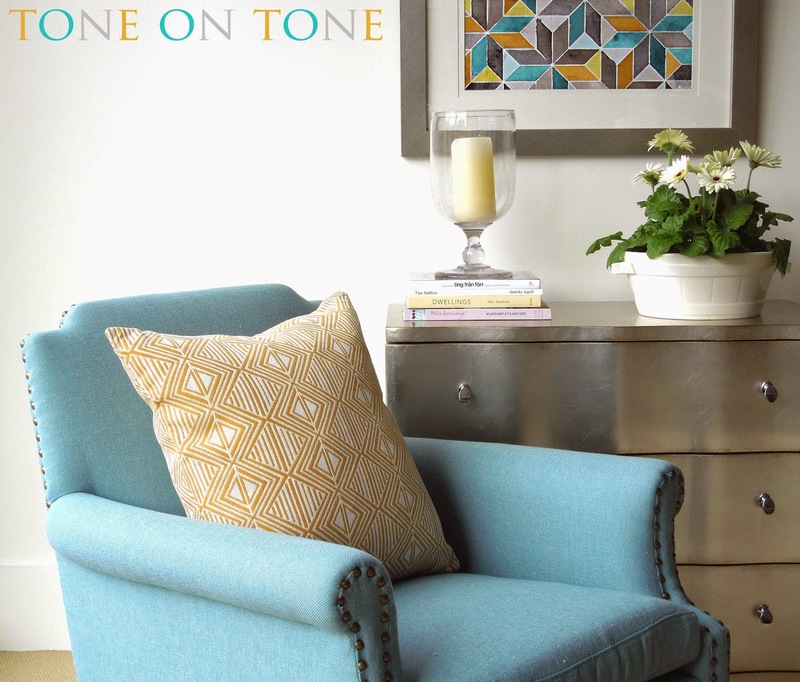 Pair of antique sconces as well as the silver leaf mirror are from Tone on Tone. 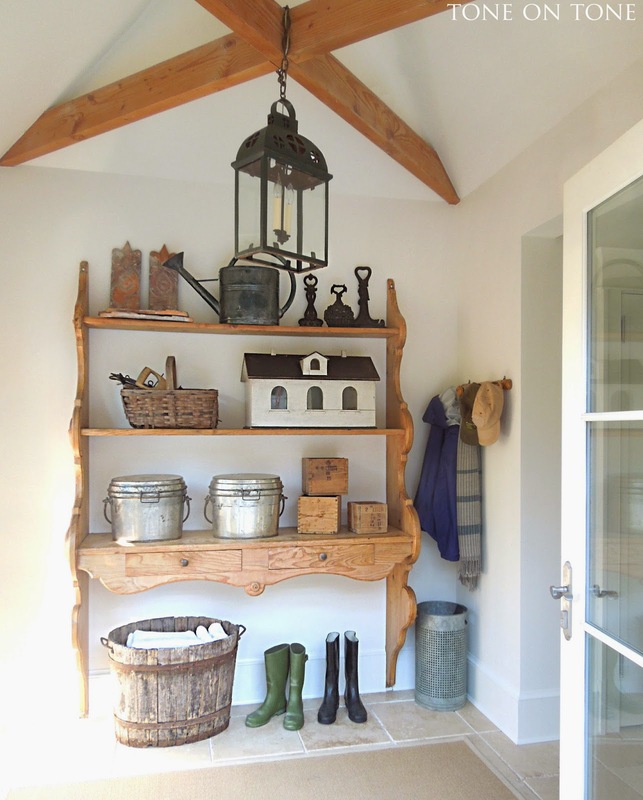 Here is the sunny mudroom with an antique pine wall shelf, exposed beams and travertine floor. The antique iron lantern is one of a pair - its mate hangs in the gazebo across the pergola terrace. Above the French doors is a cedarwood lintel. 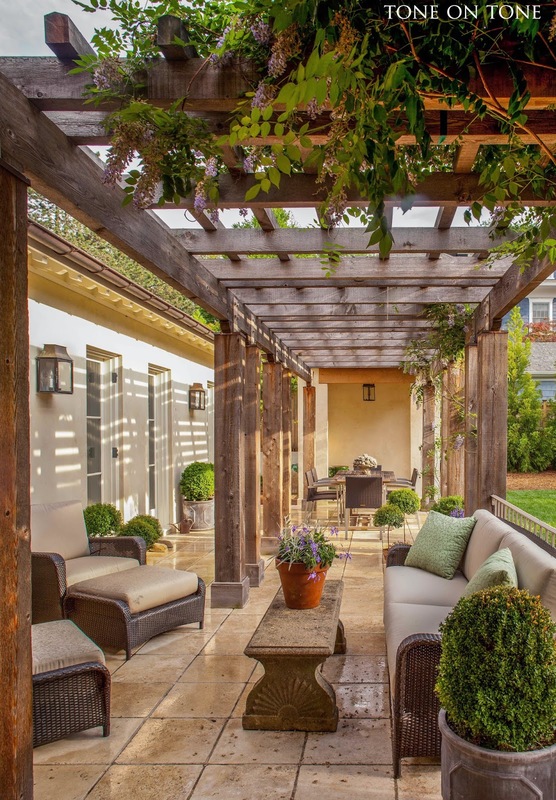 Looking from the mudroom across the wisteria-covered pergola terrace to the gazebo. 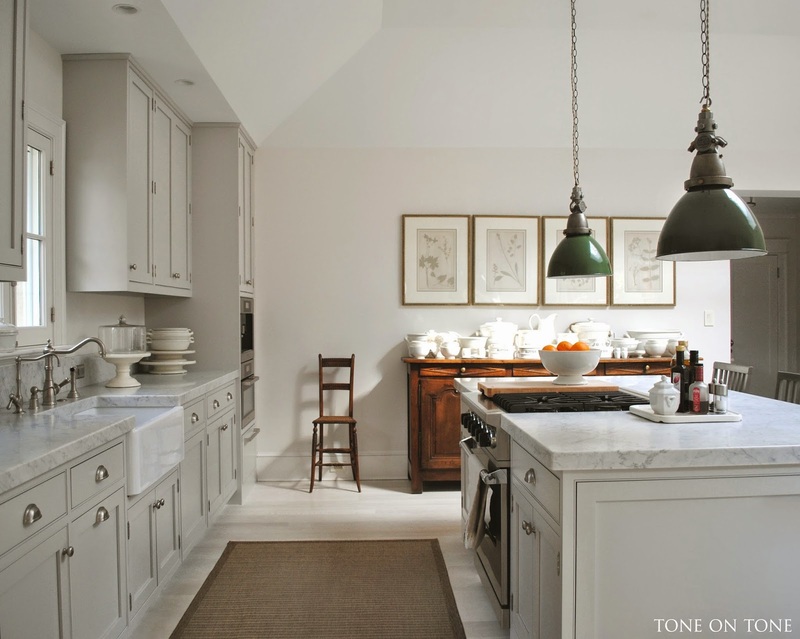 For a seamless look, the same travertine tiles as in the mudroom are also used here. Notice the many carved corbels. 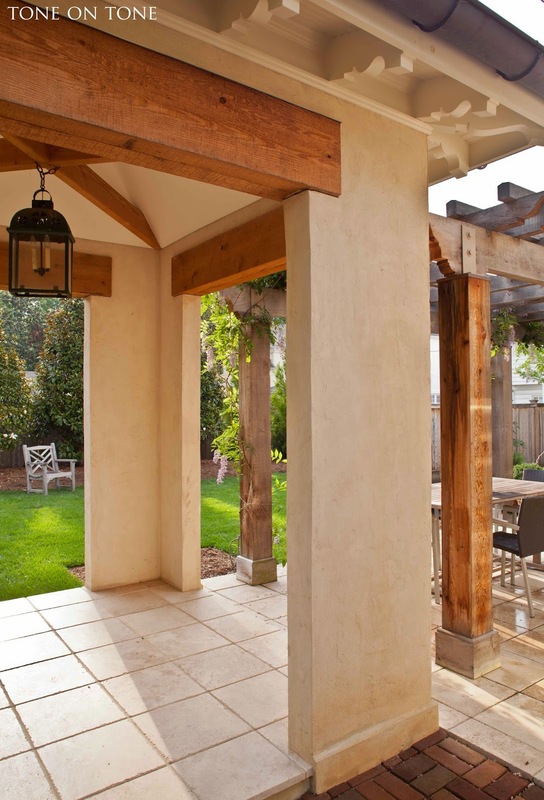 And the cedarwood lintels over each opening of the gazebo. The architecture here reminds me of a Tuscan farm house. I hope you have enjoyed this tour - more to come!